Major market moving Brexit catalysts seemed to have taken a breather this week, shifting the focus back more to risk sentiment and U.K. data for Sterling pairs. It was a much calmer week on the Brexit news front than what we saw in January, mainly highlighted by British PM Theresa May meeting with European officials this week to try to reopen Brexit negotiations. As expected, the demand to renegotiate was refused by the European Union, leaving the Brexit situation at an impasse until the next Parliament meeting this upcoming week. Looking at the charts and events of this week, it seems that U.K. data, global risk sentiment and counter currencies moves were the market drivers on Sterling pairs. Let’s start, as usual, with global risk sentiment influences, and for a broader rundown of what drove global risk sentiment, check out my review of this week’s risk sentiment drivers and its effects on market behavior in my Japanese yen weekly review here. In short, we saw early broad risk-on sentiment to start the week (likely a carry over from Friday’s bullish sentiment on positive U.S. data), but traders turned bearish on risk assets from Wednesday on as the picture of global growth turned gloomier, mainly on a heavy week of negative economic reports from around the globe. This influence on pound pairs was more clearly seen from Wednesday on as Sterling outperformed against the comdolls (AUD, NZD and CAD suffered more from the broad risk-off sentiment and from their own individual issues) and the euro, while under performing against the traditional safe haven majors (EUR, CHF & USD). 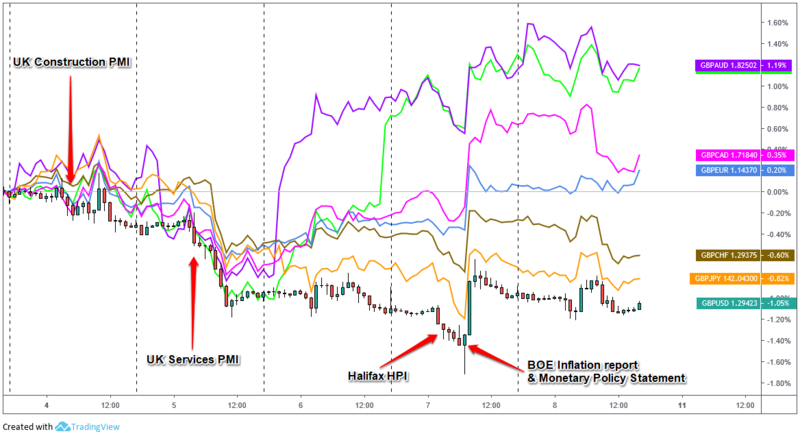 In terms of U.K. specific events and data, Construction PMI and Services PMI both disappointed relative to both expectations and previous reads, but the latter seems to have actually been a catalyst for Sterling movement as GBP pairs declined after the Services PMI data released on Tuesday. The bearish move may have also been a reaction to comments from DUP leader Arlene Foster that the EU risks chaos if it doesn’t listen to Democratic Unionist Party opinion. Then on Thursday, our other significant uniform moves in British pound pairs came early in the London session, possibly sparked by the weaker-than-expected housing prices data (-2.5% vs. 2.9% previous), but also potentially on traders positioning ahead of the Bank of England’s Inflation report and Monetary Policy statement. The Bank of England left the official bank rate unchanged at 0.75% and downgraded its global growth outlook to 1.2% versus its forecast of 1.7% back in November. Sterling quickly fell on the release of the statement, but reversed just as quickly on the comments from BOE Governor Mark Carney when he sounded optimistic on the UK economy (“The financial sector is resilient. Corporate balance sheets are strong, and the labour market is tight”), and that upside could come if there is clarity on Brexit. The spike higher was enough to get Sterling back in the green against the Loonie and the euro to join its out performance against the Aussie and Kiwi, but stay in the red versus the safe havens, eventually closing out the week mixed but net positive against the major currencies.